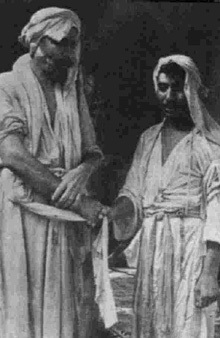 Mandaeans — Mandaeans exchanging a ritual handshake or kušṭa: Mandaeism is a monotheistic religion with a strongly dualistic worldview. Its adherents, the Mandaeans, revere Adam, Abel, Seth, Enosh, Noah, Shem, Aram and especially John the Baptist. The American led invasion of Iraq was meant to usher in democracy, liberty, freedom, and a revitalized Iraq. Sadly, from the outset other forces would be unleashed and this applies to radical Islam, terrorism, Sunni-Shia clashes, the persecution of Christians, and other negative forces. At the same time, an ancient religion was about to face a new wave of hatred and ethnic cleansing. This community, the Mandaeans, now faces virtual annihilation and now only a few thousand remain in modern day Iraq. So will this small community be forced to go into complete exile? It is clearly apparent that all minorities, be they Assyrian Christians, Mandaeans, Shabaks, Yazidis, or others, face enormous persecution and the central government is either too weak or complacent. Also, the leaders of America must be blamed for entering Iraq and then leaving the minorities to face persecution, torture, death, and ethnic cleansing. If we return back to the Mandaean community, then clearly their suffering is great and this community is in complete shock and bewilderment. The promise of a new Iraq means little because the “real reality” is abundantly clear and this applies to systematic persecution at the hands of radical Muslims and by mainstream society at large. Of course America did not intend for this to happen, however, once systematic persecution began then the response by America and allied forces was a disgrace. After all, the Assyrian Christians, Mandaeans Shabaks, Yazidis, and others, have just been abandoned and Islamization is being allowed to take place. Throughout history the Mandaeans and other minorities have faced many periods of brute force, forced conversion to Islam, massacres, pogroms, and widespread persecution. Of course, at other times they have been allowed to get on with their lives but at a price, namely paying jizya (tax) in order to be dhimmis or by being marginalized or alienated from mainstream society. The Mandaeans, like the Shabaks and Yazidis, are not protected by dhimmitude because they are not deemed to be People of the Book. This applies to being outside of Christianity, Islam, and Judaism; the three recognized religions in Islam. Therefore, persecution is tolerated because the Mandaeans are deemed to be infidels. In 2007 the BBC covered a story about the Mandaeans via the headline “Iraq’s Mandaeans face extinction” which was written by Angus Crawford. During the article Angus Crawford states that “The Mandaeans are pacifists, followers of Adam, Noah and John the Baptist.” He highlights that by 2007 more than 80% had already fled their homeland because of the fear of death and daily persecution. Therefore, by 2007 you only had approximately 7,000 Mandaeans left in Iraq and of course the situation is not getting any better because a fresh pogrom is always around the corner. Given this tragic reality it is abundantly clear that this ancient faith, which is not a threat to anyone, now faces extinction because of the Islamic faith. Of course you have many tragedies in Iraq but why have minorities been left to either die, pay jizya (tax) to Islamic radicals, face daily persecution, and other daily crimes? Why did America and allied forces, notably the British, do nothing to stop these barbaric crimes in Iraq? Did both nations, and others, believe that they did not count or is it that they just do not care? Also, what is the government of Iraq doing to protect these minorities? Or is it simply that the central government is too weak? So ex-President Bush unleashed forces he could not contain and the current leader, President Obama, wants to leave Iraq. I wonder if either Bush or Obama care about the plight of Assyrian Christians, Mandaeans, Shabaks, Turkomans, Yazidis, and other minorities, and the role of women in the new Iraq? 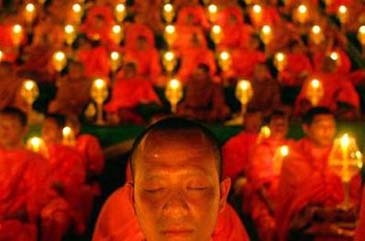 Buddhism in Thailand – Around 90% of Thailand’s population is Buddhist of the Theravada school. However, Islam is dominant in southern Thailand and today you have a major civil war and Islamists want an independent state. 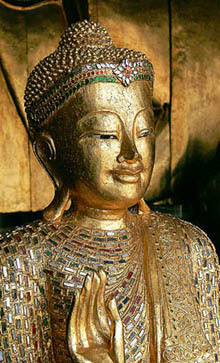 The image of Thailand is one of beautiful beaches and stunning Buddhist places of worship. However, in recent times this nation is blighted by political infighting, mass demonstrations, a delicate economy which fluctuates too much, and a devastating Islamic insurgency in southern Thailand. It is the Islamic insurgency which I will concentrate on because the current crisis in southern Thailand does have wider consequences for Southeast Asia. After all, you have Christian-Muslim tensions in parts of Indonesia and the Philippines. 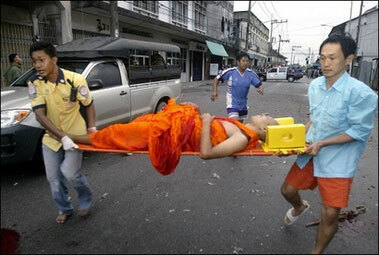 Therefore, the situation is southern Thailand is very important both internally and externally. The vast majority of people in Thailand belong to the Buddhist faith; however, southern Thailand is very different because most people are Muslim in the provinces of Yala, Narathiwat, and Pattani. Therefore, a major Sunni Muslim insurgency is currently igniting tensions in order to drive away the Buddhist minority and therefore lay the foundation of separation and independence from Thailand. The radical Sunni Islamic insurgency desires to spread fear, hatred, and an area where Buddhism is eradicated just like what happened in Afghanistan or what is happening in the Chittagong Hill Tracts in modern day Bangladesh. Therefore, the brutal Sunni Islamic insurgency is killing both moderate Muslims and Buddhists for different reasons. The reason for killing Buddhists is because certain elements within radical Sunni Islam do not believe in religious co-existence. Also, Buddhists are deemed to be infidels and within Islamic Sharia law they have no legal rights and conversion to Islam or death is sanctioned because they are not monotheists. Given this, southern Thailand resembles modern day Afghanistan and Somalia because in both these nations you have radical Sunni Islamists who will not tolerate even one single Christian church or Buddhist temple. Therefore, the slaughter of Buddhists in southern Thailand is following a similar pattern of past and current history and the current anti-Buddhist onslaught in southern Thailand is reaching new heights. 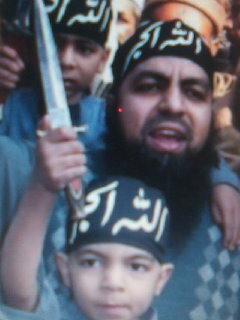 At the same time moderate Muslims are being killed by radical Sunni Islamic fanatics. Given this, Muslim teachers, administration workers, or anyone deemed to be working with the government of Thailand is liable to face the threat of death. This fear is real and the methodology of killing is intended to spread fear to all who oppose the Islamization of southern Thailand. The dream of radical Sunni Islamists in southern Thailand is to have a land with no Buddhists and to create an Islamic Sharia state. Therefore, the usual beheadings of innocents is deemed to be justified on the grounds that non-Muslims are infidels in accordance with the Koran and Hadiths. It is clear that these sayings in both the Koran and Hadiths are still potent today because radical Islamists are spreading mayhem in many nations and this also applies to nations with small minorities. After all, Christians have been burnt alive in Pakistan despite being a small minority and several Christian leaders were beheaded recently in northern Nigeria in order to intimidate the sizeable Christian population in northern Nigeria. Meanwhile Sunai Phasuk, a political analyst at Human Rights Watch, commented that “Buddhist monks have been hacked to death, clubbed to death, bombed and burned to death.” Therefore, it is clear that this Sunni Islamic insurgency is following a familiar path and this applies to the destruction of all non-Muslim elements within society or the complete dhimmitude of all non-Muslims by the rule of fear. From the Sunni Islamic insurgents point of view they believe that the former Sultanate of Pattani is the structure of their society and that Thailand had no right to annex this land. Also, many Muslims claim that they face discrimination and that they have been marginalized by the central state. 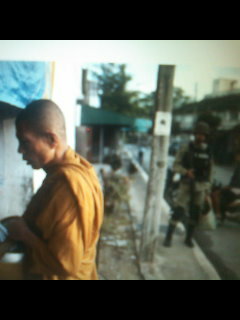 Therefore, many Muslims desire independence from Thailand. However, the degree of violence aimed at both the Buddhist community and any Muslim deemed to be in favour of the government of Thailand is brutal. Zachary Abuza states “What is new about the current conflict is the level and degree of violence, the Islamist agenda of the insurgents, and their unprecedented degree of cooperation and coordination. He continues by saying that “The level of violence in Thailand’s south has never been higher” and this can be seen clearly by the beheadings of Buddhists and hacking to death of Buddhist priests. Zachary Abuza also states this, for he says that “Nor has it been more brutal” and this is what is worrying for Thailand and the region. After all, you have many Sunni Islamic insurgencies or Sunni Islamic terrorist networks in Southeast Asia. Therefore, you have the threat of these different organizations working together in order to install radical Sunni Islam. This notably applies to Eastern Indonesia (particularly Maluku) and Mindanao in the Southern Philippines. In Eastern Indonesia and Mindanao in the Southern Philippines it is a clash between Christians and Muslims and the nation state is much weaker in both areas. However, in Indonesia the majority of Muslims support a more moderate version of Islam but in recent times radical Sunni Islam is increasing and Sunni Islamic jihadist movements have targeted both Christians and foreign nationals. The most notable movement in the region is Jemaah Islamiya which is often linked with Al Qaeda and this Sunni terrorist Islamic organization desires to create more chaos and hatred in order to spread its influence and obtain its ultimate objective. This objective, just like the radical Sunni Islamic objective in Afghanistan, Iraq, Pakistan, Somalia, and other nations, is to create an Islamic Sharia state and enforce the slavery of non-Muslims by a policy of dhimmitude. Zachary Abuza also mentions that Salafist and Wahabbi influence is also growing because moderate Sunni Muslim leaders have been sternly rebuked or attacked by conservative Sunni Islamists. Also, it is noticeable that more women are covering up in purdah and clearly this will lead to even more cultural divisions within society in Southern Thailand. However, overall Zachary Abuza hints that the main cause in Southern Thailand is internal and currently Jemaah Islamiya is not strong enough to export its violence on a major scale to Southern Thailand. Also, Jemaah Islamiya is primarily focused on Indonesia and the security forces in Indonesia are fully aware about this problem. Overall, it is clear that elements within Southern Thailand desire a non-Buddhist land and the role of Sunni Islamic indoctrination is now turning its hatred against moderate Sunni Muslim leaders. This hatred and alienation of the younger generation began after many studied at international universities throughout the Middle East and clearly some funding from the Middle East is being used to spread radical Sunni Islamic versions of Islam. The government of Thailand is at a loss about the current crisis because of internal convulsions within the political system. At times the military have responded with brute force in order to contain the insurgency in Southern Thailand but at other times a more moderate approach is enforced. Yet from a wider perspective it is clear that you have many radical Sunni Islamic terrorist organizations in Southeast Asia and terrorist networks survive and flourish in failed states or where centralization is very weak. Therefore, the future of Southern Thailand is also an issue for Indonesia and the Philippines because both nations have internal problems with radical Islam. Also, the heart of Islam is now at war with itself and moderate versions in Southern Thailand and Indonesia are being put under tremendous pressure in certain regions. Therefore, the hidden war in Southern Thailand by radical Sunni Islamists is being aimed at moderate Muslims and Buddhists alike. However, for the Buddhists, they face complete annihilation and one day Southern Thailand may end up like Afghanistan, Central Asia, and other areas which once had a thriving Buddhist community. It would appear that Islamization is now a reality and in time the Buddhist minority will continue to dwindle and the only saving grace at the moment for Buddhists is the military of Thailand.